The smartphone has become more than just a simple mobile phone. People now use it for online access and for other means. It is good that service providers now offer services to make this possible. However, it is not always free. Data usage has become a concern for many mobile phone subscribers, now that service plans are no longer offering unlimited data usage due to the huge demand. It has become important for people to keep track of their data usage or face increased monthly service charges on their smartphone. The DataMan Pro iOS app will help iPhone users in this area. The DataMan Pro is a useful app for people who wish to keep track of their data usage to avoid paying for over usage on their phone bill. The DataMan Pro give you the details of how, when, where you used those valuable mobile bandwidth. It also provides users with valuable statistics about their data usage. Features of the DataMan Pro include real-time tracking of your data usage directly from iOS. You need not wait for your carrier to give you the updates you need. Besides, what updates your carrier may give you may not always be in real time. 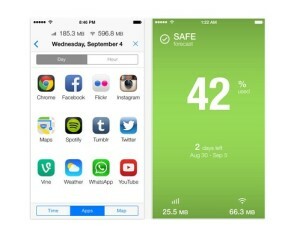 The app can keep track of cellular as well as WiFi data usage. It can also provide notifications to let you know whether you are close to reaching usage limits. The app can also help inform you what apps are eating up your data allowance on a daily basis. This will help you root out those data-hungry apps and put your data to more efficient use. The DataMan Pro works with all carriers and can support many data plan types. Its beautiful and clean interface is also easy to use and understand. The DataMan Pro is a handy tool for people who wish to make the most out of their data plan by using them efficiently within the monthly limits. This app is available for a $ 5 download at the App Store.